As a leading provider of network equipment for SMBs, NETGEAR® understands the importance of reliable and high performance networks. With the growth of virtualization, cloud-based services and applications like VoIP, video streaming and IP surveillance, SMB networks need to extend beyond simple reliability to simpler management and remote monitoring to ensure your network is "always up". NETGEAR also understands that small business owners shouldn't have to understand networking and IT; they need a network that's easy-to-setup and is reliable, so they can focus on their business, not their network. To that end, NETGEAR is introducing our most versatile and easy-to-manage switches ever, NETGEAR Insight Managed Smart Cloud switches. With the NETGEAR Insight app, you can setup, manage, and monitor your networks from anywhere, anytime, from the palm of your hand on your phone or tablet! Or, for a larger screen experience, you can use the Insight Cloud Portal from your PC, Mac, or tablet web browser. NETGEAR Insight Managed Switches and Wireless Access Points using the NETGEAR Insight app allow for cross-device automated configuration of VLANs, QoS, ACLs, and LAGs. Auto-join and configure (zero-touch privisioning) allows for additional devices added seamlessly. NETGEAR Insight Managed switches are fully-integrated, cloud-manageable, plug-andplay devices. Just connect to your network and without any setup, they're passing traffic. For configuration setup, management, and monitoring, you can use the Insight mobile app on your mobile device or the Insight Cloud Portal from your PC, Mac, or tablet web browser. No additional cloud controller, appliance, network manager, or on-premise cloud server necessary. Insight Managed switches have a modern, clean design, with at-a-glance cloud, power, fan, and PoE max1 LEDs for quick status monitoring. On-port LEDs for link/activity and PoE power1 allow for port-specific connectivity monitoring. 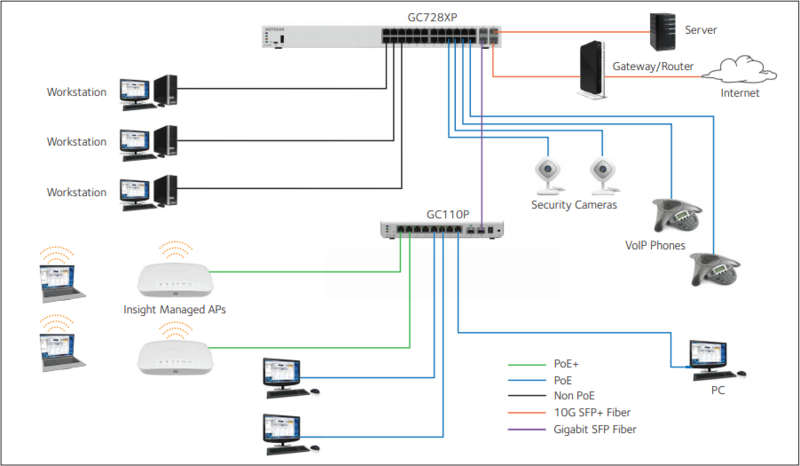 GC728X and GC728XP have 24 copper Gigabit Ethernet ports; GC752X and GC752XP have 48 copper Gigabit Ethernet ports. All models also have two dedicated 1G SFP fiber ports, and two dedicated 10G SFP+ fiber ports for maximum connectivity. On PoE+ models (GC728XP and GC752XP), all Gigabit Ethernet copper ports support PoE or PoE+, with a PoE power budget of 390W (GC728XP) and 505W (GC752XP). Dedicated Gigabit SFP and 10G SFP+ ports provide fiber uplinks for server interconnects or across long distances, or can be used to build dual redundancy by a trunked uplink with link aggregation and failover. * This product comes with a limited warranty that is valid only if purchased from a NETGEAR authorised reseller, and modifications to product may void the warranty; covers hardware, fans, and internal power supplies-not software or external power supplies; see http://www.netgear.com/about/warranty/ for details. ** The NETGEAR OnCall 24x7 contract provides unlimited phone, chat and email technical support for your networking product. Fully-integrated Cloud-manageable Devices Require no additional hardware (cloud keys, network portals, local servers, VPN or proxy appliances etc) to directly connect to the cloud and allow remote management. No additional hardware, no software or server to setup; nothing. Just connect and go. 1000BASE-T Copper Ethernet PoE+ (802.3at) connections (GC728XP/GC752XP) Connect multiple power demanding devices to your network with a single wire for power and connectivity. Support high-density VoIP, Surveillance and Wi-Fi AP deployments, scalable for future growth. Never face the risk of running out of PoE ports or PoE power budget with power budgets of 390W (GC728XP) and 505W (GC752XP). 1000BASE-X SFP ports Two dedicated Gigabit SFP ports provide fiber uplinks without sacrificing any downlink copper Gigabit Ethernet port, and across long distances. Support for Fiber and Copper modules. 10GBASE-X SFP+ ports Two dedicated 10-Gigabit SFP+ fiber ports provide flexibility to uplink to 10G-capable core or aggregation switches that support fiber links. Backward compatible to Gigabit fiber. Support copper or fiber modules. Cloud, Power, PoE (GC728XP/ GC752XP only), and Fan LEDs Quickly confirm switch has power and is connected to the cloud/internet, fan is operating normally or not, and if max PoE budget has been reached. USB Port Quickly and conveniently upgrade or restore firmware, load or backup configuration files, or download system log files for troubleshooting. Micro-USB Debug Port Only for use when directed by customer support for troubleshooting. Low Acoustics Temperature-based fan-speed control minimizes system acoustic noise in any environment as low as 25 dB at 25°C (77°F) ambient. Rackmount or Desktop Flexible deployment in standard 19" rack using the included rackmount kit or on desktop using included rubber feet. Kensington Lock Slot Prevent theft, removal, or tampering when used for desktop deployment. Remote setup, management, and monitoring anywhere, anytime, from your mobile device, PC, Mac, or tablet Locally or remotely setup, configure, manage, monitor or even troubleshoot your network from anywhere, anytime. Check network status, view dashboards for network health and activity, power cycle PoE ports, etc, and update firmware remotely. No need to be on-site, open up ports to your network, or VPN into it. Auto-join and Configure (Zero-Touch Provisioning) Additional Insight Managed devices added to the network automatically inherit settings and configuration of the network. Multi-site, Multi-network Single Pane-of-Glass View View and configure multiple networks across multiple sites, all from one single app; NETGEAR Insight. Comprehensive IPv6 Support for Management, ACLs and QoS Build current network with future in mind. Ensure investment protection and a smooth migration to an IPv6-based network without switch replacement. Robust Security Features (802.1x, ACLs, MAC Authentication) Build a secured, converged network with all types of traffic by preventing external attacks and blocking malware while allowing secure access for authorised users. Comprehensive QoS Features (802.1p, DSCP, Rate-limiting) Advanced controls for optimized network performance and better delivery of mission-critical traffic such as voice and video. Private VLAN Private VLANs help reduce broadcast with added security. Port Trunking/Link Aggregation (LACP) Build up bigger bandwidth to support aggregated uplink/downlink traffic or to provide redundant link(s). Aggregate up to 8 ports for 8Gbps connections. Loop Prevention and Auto-DoS Prevention Detect and prevent (auto port shutdown) accidental network loops and protect against DoS attacks. PoE Timer and Scheduling Allows IT administrators to increase network security, better utilize network resources and conserve energy by scheduling or remotely controlling on/off of PoE ports. Port Mirroring and Cable Test Many-to-one port mirroring for better and quicker network diagnostics and troubleshooting. Cable test easily identifies bad Ethernet cables. Firmware Updates from Cloud Direct cloud-to-device firmware updates, initiated and/or scheduled using the Insight mobile app or Insight Cloud Portal, all from the palm of your hand, anytime, anywhere! Why Insight Managed Smart Cloud Switches? 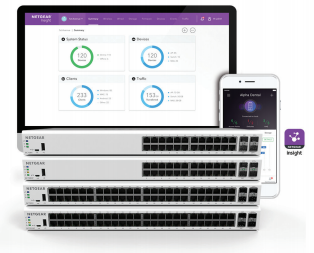 NETGEAR is revolutionizing unified, centralized network management with it's new line of Insight Managed Smart Cloud Switches and Wireless Access Points, all managed from the palm of your hand, anytime, anywhere, on your phone or tablet using the NETGEAR Insight mobile app. Or, for a larger screen experience, from your PC, Mac, or tablet web browser using the Insight Cloud Portal. Ideal for SMBs, offices, retail stores, education, healthcare, owner-operated businesses, etc. IT expert or no networking experience at all: Insight Managed Smart Cloud Switches let you focus on your business, not maintaining your network. Know immediately if and when your network is not running perfectly; not after you've already lost business or suffered significant down-time. Advanced L2+/L3 Lite network features such as IPv4/IPv6 management, VLANs, DiffServ QoS, LACP Link Aggregation, Spanning Tree, Static Routing, advanced per-port PoE controls and PoE scheduling will satisfy even the most advanced small business networks. Fundamentally change and simplify network usability for easier and smoother deployment of voice, video, and WLAN on the same converged platform. Industry-leading 5-year warranty on switches, 5-year Next-Business-Day (NBD) replacement, and 90-days free technical support** for peaceof-mind. Extended ProSUPPORT service plans available for purchase. Within small and medium-sized organizations, there is growing adoption of PoE devices such as VoIP phones, IP security cameras, wireless access points, proximity sensors, LED lighting, door locks, and other IoT devices that require network switches capable of supporting dense PoE installations. Wireless access points and pan-tilt-zoom HD cameras using Wave 2 802.11ac Wi-Fi also require PoE+ power (802.3at), increasing the power demands on PoE switches. With a generous power budget of 390W (GC728XP) and 505W (GC752XP), the PoE versions are designed to meet the current and future needs of wireless converged networks. Download the NETGEAR Insight Managed Gigabit Ethernet/10G SFP+ Smart Cloud Switches Datasheet (PDF).